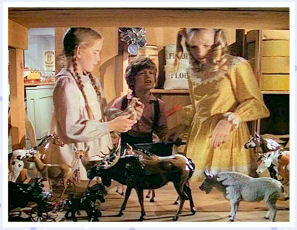 "THE VOICE OF TINKER JONES"
I loved seeing the children working together and even Nellie and Willie cooperating and giving some of their toys for the bell! I commend the actor who played Tinker. It's hard to act only with body movements and facial expressions and not use your voice. He did a great job to convey his thoughts. Karen Grassle did an outstanding job in A matter of faith when she had to carry scenes all by herself, too. When I was twelve or maybe thirteen I thought this episode was really dumb. :b Now though I really like it. I agree, Tinker did an excellent job! That would've been really hard to do. 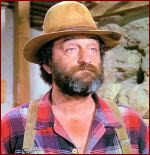 Now, Mr. Kennedy later becomes Judd Larabee, right? The parts where the grown-ups are arguing in the church are amusing. Some of the things said are really funny. "Why, next think you know, she'll be preaching." Harriet looks very appalled! 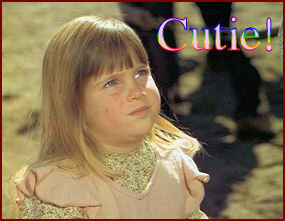 Did anyone else here catch Tinker Jones in "Columbo: Double Exposure"? I really love this episode, and it brings tears to my eyes. 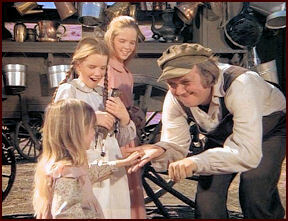 I think it is really wonderful that the children are able to give up their toys, and put aside their differences to help Tinker make the bell for the church...the kids are able to show a maturity that, in this instance, many of the adults are not able to do. I just saw this one again yesterday. It's one of my favorites. A lot of my favorites are from season 1. That was a great season. 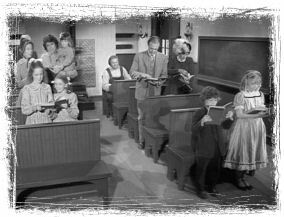 What's great about this episode is the kids coming together, sacrificing their toys, to get the church what it needs. They showed the adults how to cooperate, put their petty differences aside, and get things done. Good esp!..Adults can sometimes be really childish at times.Nice the kids helped and fixed the problem and showed the adults how silly they were. Did anyone notice a young Sean Penn as one of the school kids? He had no lines. I still remember about 6 years ago I was watching this episode and all of a sudden those beady little eyes...and that big nose. I looked it up on the internet and sure enough... it was him. His father Leo Penn directed this episode. Look for him next time! No foolin'?!! Makes me wonder who else 'now famous' appeared in the show. Someone care to start a thread? Welcome to the board easy72000!! I watched this episode last night. It was very good at portraying how churches can split over these kinds of things (sadly). 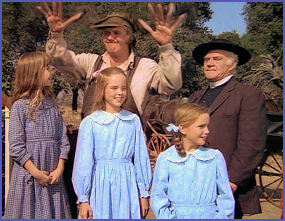 And of course I'm glad that the church all got back together at the end. this shows that adults really act childish & unfair sometimes.Adults can really learn from children sometimes.I mean werid has it sounds sometimes kids act more grown up then adults. I think its nice what the kids did! great episode. I love, how all the children of WG helped out with Tinker Jones. One funny line in this one, especially if you watch it after you've seen the entire series, is Kennedy's line, when he's complaining about Mrs. Oleson wanting to put the Olesons' name on the plaque: "The next thing you know she'll want to change the name of the town to Olesonville!" Well, she would -- eight years later. 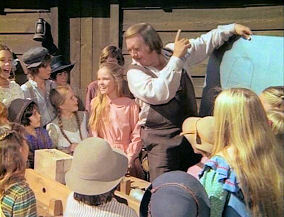 What I loved about this episode, was at the end, all the children, even Nellie and Willie was "good" and everyone was proud of them. Sometimes I wish they showed a "one time" character again, and Tinker was one of them. I just got done watching the episode. 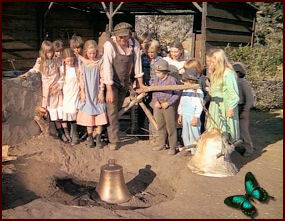 I love how the children helped Tinker make the bell. Subject: Re: "THE VOICE OF TINKER JONES"
» Red Floral Vase marked "K.Jones"